Much to the joy of any bread lover who has enjoyed her bread at the French Laundry or at her bakery Della Fattoria, Kathleen Weber has, at last, published her first book: Della Fattoria Bread. The official Pub date is October 7 but the book is available on Amazon for preorder. Della Fattoria Bread: 63 Foolproof Recipes for Yeasted, Enriched & Naturally Leavened BreadsNot only does it have enticing precisely written recipes from the hearth, her stories from the heart are fascinating and beautifully written and I am reading this book page by page as well as baking from it. 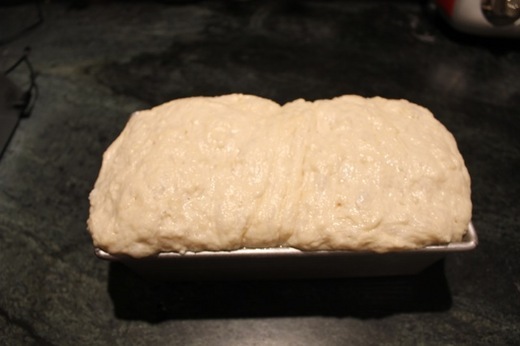 I have already made two of the breads with great success and will include step by step photos on each of two postings. I first met and fell in love with Kathleen's breads at my first dinner at The French Laundry in Yountville, Ca. When the wait person told me that the bread at that time was not made in house, I lost no time in asking my northern California friends to find out who was baking the bread. I was in the process of writing The Bread Bible and put in a call to Kathleen Weber, timidly asking if she would give me the recipe for her seeded wheat sourdough bread that I so loved. I was stunned by her generous response. She actually said that SHE was honored and proceeded to send me a detailed recipe in addition to the flour and yeast she used for the bread and even offered to send the water! And that is how I fell in love with Kathleen as a perfect reflection of the goodness, beauty, and integrity of her bread. Over the years, and many visits to the San Francisco area, we developed a special bond. On one visit, my husband and the Webers met at Daniel Patterson's first restaurant (Elizabeth Daniels) when they drove in to deliver their bread to the restaurant. On another visit, my dear friend Diane Boate and I drove up to their home and Ed showed off his impressive self-made wood-fired oven and introduced me to an infra red point and shoot thermometer used to determine the interior temperature (which I purchased in short order). And on still another visit Diane and I brought Daniel Patterson as a surprise visit to Kathleen's Petaluma bakery where he announced his engagement and Kathleen offered to make the bread while I offered to make the wedding cake. Afterwards I asked Kathleen if she thought he had heard? "Oh yes!" she said. My response "Oh God!" (Making a wedding cake away from my own kitchen is a scary proposition but I was so glad I did it. Not only were we all guests at the wedding the following year, the "Deep Chocolate Passion Wedding Cake" turned out to be the most beautiful and delicious cake in Rose's Heavenly Cakes a few years later. When an advance copy of Kathleen's new book arrived at my home I opened it up immediately and to my amazement saw my recipe for brioche! I had completely forgotten that a few years ago Kathleen asked me permission to use it for the book and of course I had been delighted. I have to admit tears of joy came to my eyes that life seemed to have come a full circle. In the headnote she writes: ...And to this day, Rose's brioche is the only one I've ever made. It looks like golden satin and is the softest most elastic dough I have ever worked with. Bliss. 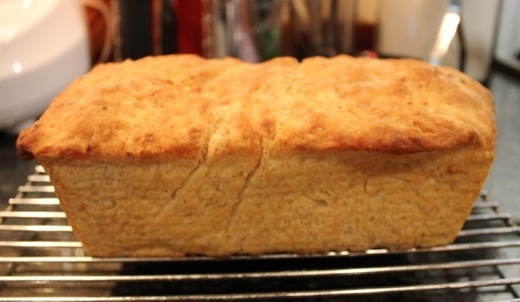 When I emailed Kathleen to ask which bread I should try first from her new book, her answer was: The bread that I had the most fun making is the Arborio Rice Bread from Elizabeth David. It's absurdly easy and unusual, working with all that warm, almost hot, rice. The texture of that bread toasted is pretty fabulous. It was just a surprise to me, and I really love surprises! In the headnote Kathleen writes: "Arborio is, of course, the rice that gives risotto its creaminess, and, sure enough, those fat, starchy grains give the bread a similarly creamy texture." And now I'm taking a short break to follow Ed Weber's advice to toast a piece of this bread to give it a delicate crunch and to make a soft boiled egg to go with it. 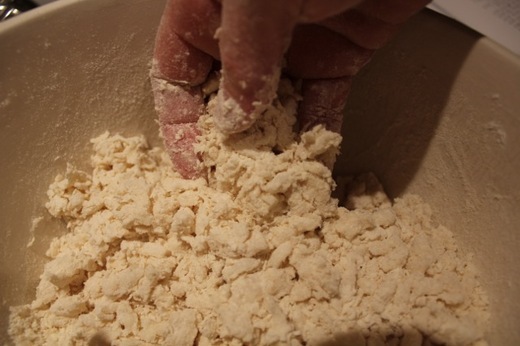 Here are the step by step photos which Woody took as I was making the dough. Kathleen wrote to me: Didn't you find that even though the dough was wet, you could kind of shove it together and get it to hold its shape? YES! The wobbliest part it just before it goes into the oven, it seems to be the wettest, and you'd never guess such a puddle could bake up so beautifully. RIGHT! She also wrote: It may feel delicate but in fact it's sturdy. AGREED Next posting, on the pub date of October 7, will be on Kathleen's signature loaf: The Meyer Lemon-Rosemary Campagne Boule for which I will wake up my sleeping beauty sour dough starter. Mixing the cooked Arborio rice into the flour mixture to form a crumbly mixture. Adding the water to the flour mixture. 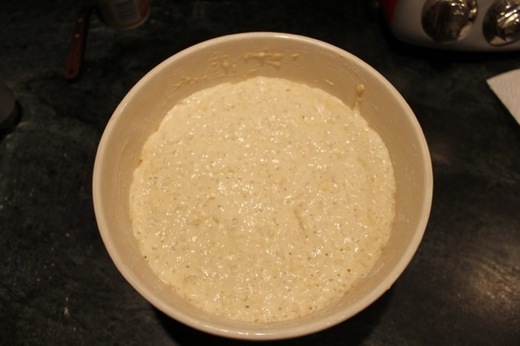 The dough after it's first rise. 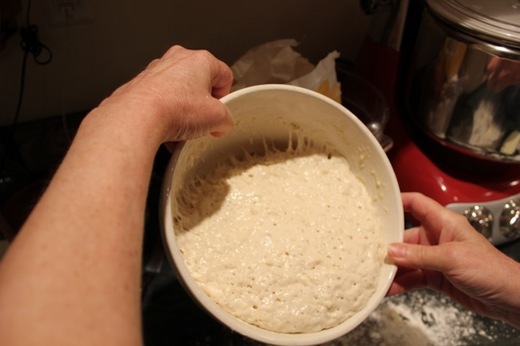 Emptying the dough onto the counter. 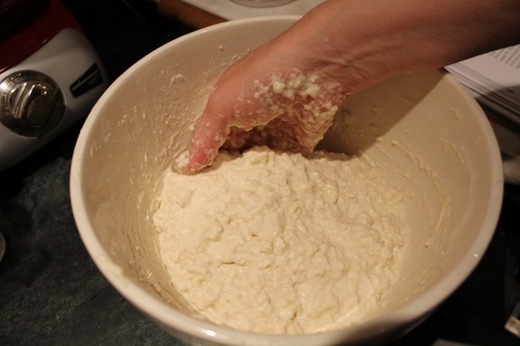 Shaping the soft dough into a loaf. 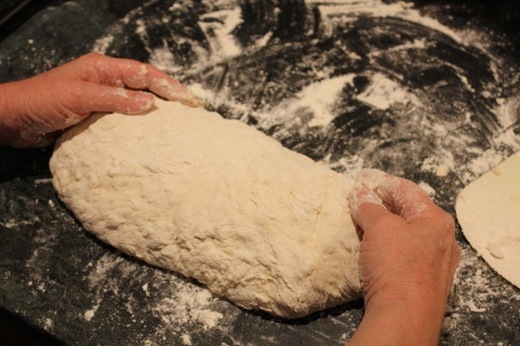 The risen dough ready to bake.